Fin de Año is the New Year's party. 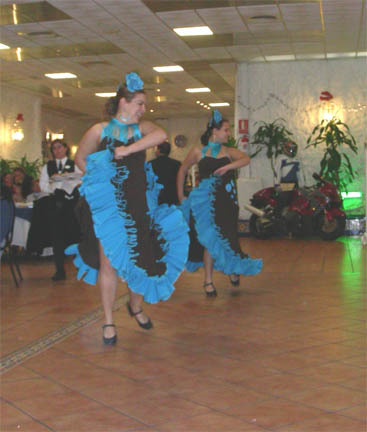 Both the GoldWing Club de Andalucia (on Dec. 1-2-3) and the GoldWing Clube de Portugal (on Dec 8-9-10) held parties to celebrate the end of the year. Each club has made reservations at a 4-star resort and planned outings and multi-course feasts. We went to both of them. 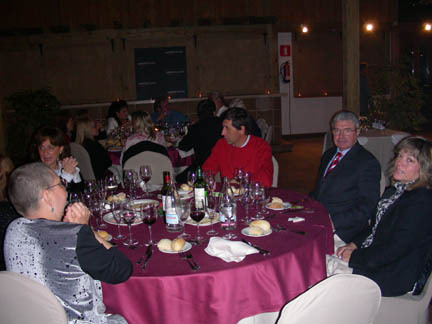 First, the GoldWing Club de Andalucia (GWCA) held their Concentración in Isla Cristina, a resort town on the coast near the border with Portugal from December first to the third. We arrived on Friday afternoon and we went to lunch at a nice restaurant on the beachfront. We had wine, several appetizers and local fish. All very good. We sat with our landlord (in the white shirt), another club member and their wives. The group of them wouldn't even let us pay our fair share. Thanks to all of you. That evening for dinner we were greeted with an open bar and a buffet dinner of seafood. The shrimp, langoustines, crab and fish were piled high. Of course I piled high with the shrimp and I was only one of many who did. I had left the camera in the room so you don't get any pictures of it. Too bad, it was amazing. The next day a ride was scheduled to go see full-size replicas of Columbus' three ships followed by a lunch in town. But it was pouring down rain, large heavy drops driven by a wind. The ride was canceled and a bus was rented to take us to the lunch which was at a rental hall that is used for banquets, weddings, etc. We had a 4 or 5 course meal (I lost count) with another open bar. Again we had local seafood, very delicious. After the meal we were entertained by a group of Flamenco dancers for about an hour. Then the audience took their turn at it. Some of them were quite good at it. Eventually the bus returned and we went back to the hotel. That afternoon it was not raining but everything was still wet. After we returned to the hotel we visited and talked the afternoon away. 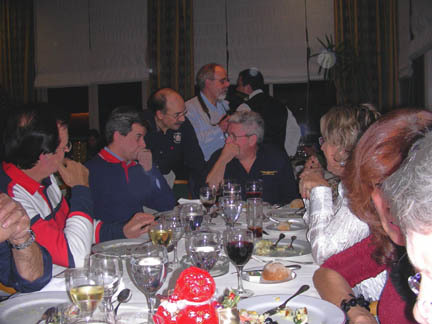 That evening was the big banquet at the hotel. This is the grand meal (the others were just to whet our appetite). Another open bar, and more food than a army can eat. Again the food was great. We sat with a really nice couple from Seville and others. As you can see, this dinner is fancy dress. Thank goodness I had a shirt with a collar to wear. Kathy had bought a nice blouse a few days earlier. Other than that we have clothes for riding and camping. After the food there were awards and certificates given out. My Spanish is not good enough to know what they were for, but if they followed the same ideas we do in the US then they were probably for good service to the club and participating in the year's events. At the end a drawing was held, I didn't understand them when they said what the prize was. Everybody's names were put into a bag and one was drawn, it was our name!!! It is after 1:00 in the morning and Kathy had given up and gone to bed. I went up to the stage and was given a sheet of paper. I make out enough of what's written on it to realize we have won a free weekend at this resort for sometime in 2007. At our GWRRA club breakfasts at home we have never won the free breakfast that is given out each month. I guess we were saving up our luck for this dinner. After the food, drink, prizes and awards are all finished everyone moved to the nightclub downstairs and danced the night away. I only made it to a little after 2:00 AM and then returned to the room. On Sunday morning the weather is again "another day in Paradise" and we ride into the old part of town to have a "Tapas" lunch at a local bar/restaurante. (Here I should explain what "Tapas" are. They are small, often bite-size, portions of food available at most, if not all, Spanish bars. They are often local specialties and there are a variety of them to purchase. These are usually eaten standing up at the bar with a beer or wine to drink. Tapas touring, going from bar to bar, and trying their best Tapas is a national sport. The name, Tapas, comes from them originally being placed on the saucer that was placed on top of one's drink to keep the flies out. Some enterprising barkeep decided to serve a bite of food on the saucer that was being used in order to attract more business, and today this is a tradition that Spain is famous for.) 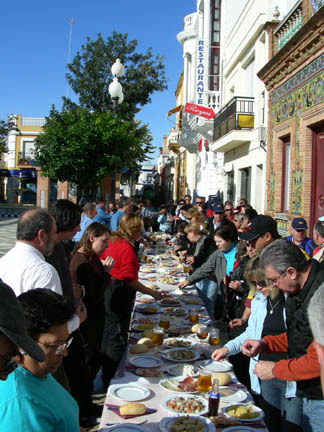 For this group the Tapas were placed on a long table along the side of the plaza in front of the bar. And instead of serving bite-size portions, they were placed by the plate full on the table and you helped yourself to what you wanted. The building beside the bar, and behind the table was an 1890 Masonic hall, now a museum, that had a great tiled front. Then it was time to return home, full of food, drink, and friendship. Next weekend is the Portuguese Fin de Año and we are looking forward to meeting our Portuguese friends again. We left our apartment at 7:00 AM Friday morning in the dark, in a downpour rain and headed for the town of Peso de Régua on the Douro River in northern Portugal. An hour and a half later as we passed through Seville we drove out from under the cloud bank and had blue sky and sunshine, but we are soaked. As we went north we dried out somewhat but my electric heated jacket and gloves quit working. About 50 km. before we arrived we are going over some mountains on a windy 2-lane road when it starts to snow, not sticking to anything except my faceshield and I am getting cold. But we arrived OK at about 4:30 PM and signed in, put the gear in the room spread out to dry and headed for the bar to greet other club members. That night we went to a Port winery for a tour and dinner. 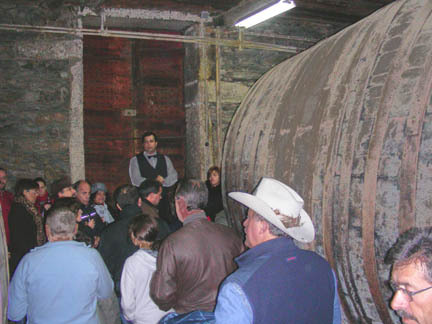 The tour was given in Portuguese, of course, but looking at the huge wooden barrels was interesting. 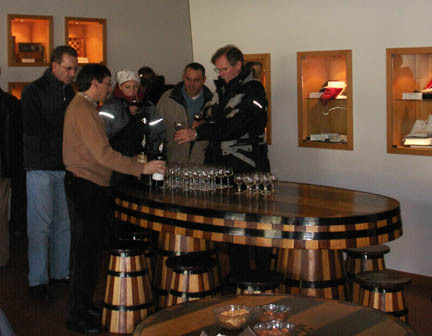 The wineries here in Europe don't use as much stainless steel as wineries do near our home. Probably because the stainless steel had not yet been invented when these people started making wine. This winery is older than the United States by 20 years. Several of the members had brought their cars, either because they had too much stuff to bring for the club or because of the weather. We rode to the winery in a car and could drink to our heart's content. We had another great meal served in style with all the wine included. Last weekend we had seafood at almost every meal, this weekend we are having meat at our meals. Here we're having beef. It balances out nicely. Afterwards there was music and dancing. In the wee hours of the morning we crawled into bed and set the alarm, we have a ride up the river to another winery in the morning. The river flows down a very steep sided valley with wineries perched on the slopes. 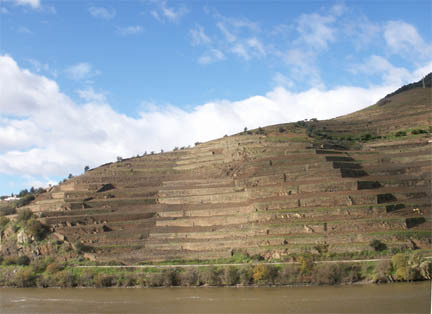 The hills are heavily terraced and planted to grapes. These are terraces made of dry stacked stone and backfilled with dirt and cover thousands of acres. There are hundreds of years of effort evident in the building these terraces. We rode about 25 km. up the valley and sampled Port at this winery and investigated the items for sale in the gift shop. We bought a 20 yr. old Tawny Port to bring home to Washington and another, cheaper, bottle to drink here. Afterwards we rode back down the river and up the into the hills on the south side of the river to a restaurant with a great view and more meat, this time roasted goat, but we did have more huge shrimp for an appetizer. Because we are on the bike we are careful of the alcohol even though it is all included. We make it back to the hotel safely. This evening is the big meal and the awards, but first the members meeting where the new board is elected. The Saturday evening meal, like the one last week, is a feast of several courses, again with all the wine you can drink. We ate course after course of great food, again meat not seafood, and drank much good wine. They had a picture contest during dinner. Before dinner everyone, who wanted to, had submitted two pictures taken during that day. The submitted pictures (all digital) were taken to a print shop and printed and then posted for voting. We didn't win, but Kathy and I had fun trying to pick out two to submit. After dinner were the prizes for various member's activities and a certificate of attendance to each participant. We'll post it at home next to the one we received at their March gathering in Cascais. The next day we headed down river. It is now Sunday and we packed up and checked out. We will have the final meal down river near the city of Porto. 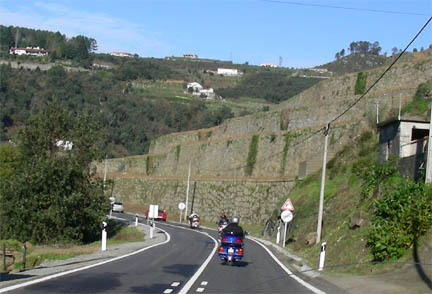 The road winds along the side of the Douro River valley, going in and out of the side valleys for about 80 km (50 miles). Our speed seldom got above 50 kph (about 35 mph) for two hours. We had mostly sunny weather with a few white fluffy clouds floating by. It was a beautiful ride. We arrived at this restaurant perched on a hilltop and had our final meal of this gathering, still having meat as the main course. Afterwards we followed our friend Nuno south to Lisbon and spent the night there. The next morning we picked up a package we had left with him in September and headed to Évora, an ancient town about an hour to the east of Lisbon. 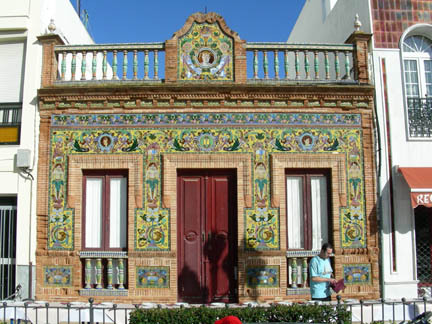 We have been invited to visit this town by Jose and Maria João , two members of the club. The two weekends were very similar and very different. 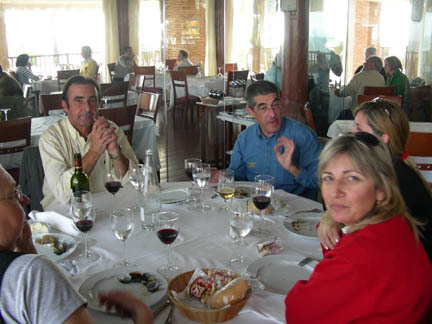 The great food (both seafood and meat), good wines and the friendship were similar. The weather, starting out bad and getting good was similar. The countryside we rode through was very different, ranging from seaside resort to mountain valley resort. All in all, two very good weekends. Now the dieting has to get serious, we must have put on 5 pounds (2 kilo) or more. Before Christmas we visited our friends in Evora, Portugal.